955 km of bicycle travelling from Lake Constance in Switzerland to Liechtenstein and to Vorarlberg in Austria, via St. Anton and Reschen Pass to Italy, along Ortler Mountain to Stilfser Joch and back to Switzerland, through Upper Engadin via St. Moritz to Flims and via Andermatt to the north face of the Eiger at Grindelwald, around Lake Brienz northwards via Lake Lucerne and Lake Zurich to the Rhine Falls near Schaffhausen and to Germany, via Constance back to the southern shore of Lake Constance in Switzerland. Do you like Cycling the European Alps? 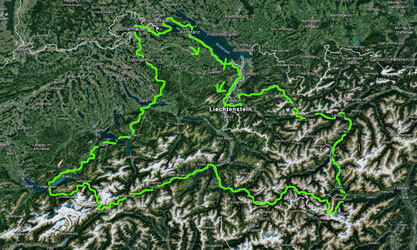 Share Cycling the European Alps! (38 km, 158 metres in altitude) We said goodbye to my sister and her family, where we had been visiting Rheineck on the southeastern shore of Lake Constance in Switzerland for a few days, and cycled south, following the course of the Rhine upstream. Behind Sennwald we turned east from the main road and crossed the Rhine. (3.5 km, 4 metres in altitude) By crossing the Rhine we also crossed the border into Liechtenstein. I would gladly have driven the pass road up to Malbun, but because of time constraints and because we had to drive the same way back several kilometers and therefore had to drive twice, we decided against it. Thus, we only crossed the country at its particularly narrow point in the north and after about 3.5 km we were already on the border to Austria. (179 km, 3,910 metres in altitude) We crossed the border at Feldkirch, turned off to the north and then swung east on the road to the Furkajoch. The road meandered through beautiful countryside and steadily uphill in light traffic. After some time, Anne got a pain in her knees and so we decided to set up the tent off the road between trees and with a great view after only 70 km at 1,380 m. Later it rained stronger and it was only 10 degrees. We slept for a long time, also to relax on our knees, and rode late. We climbed the remaining altitude of the Furkajoch up to 1,760 m altitude. Anne had to push some and so we rolled only down to Au at 800 m, relaxed the rest of the day at the campsite and went the next day to the doctor. A tendon was probably overloaded, so first of all protection was announced! So we drove with the gondola on the Diedamskopf on 2.090 m and ran to the Holdermoos nature park. The next day my knee was not better and so I walked alone up to the mountain crystal hut at 1,250 m.
The next morning we started late and very slowly. At a gentle pace, the Hochtannbergpass climbed to 1,676 m and the knee seemed to work. However, it rained constantly, so we took a break in Lech am Arlberg. As the rain had subsided we continued up to Zürs, which is just as busy in the winter as Lech, but in the summer it seemed like a ghost town, as all hotels and restaurants were closed. We continued up to the Flexenpass at 1,773 m before we rolled downhill again and pitched our tent in the middle of the Arlberg region just before the Arlberg pass at an altitude of 1,695 m. We cooked, it was raining, but the knee seemed fine! In the morning the sun finally shone again and we cycled up to the Arlberg pass at 1,793 m. Due to the rather urban and therefore not so beautiful St. Anton we cycled downhill to Landeck at 800 m.
There we turned south and followed the Inn Valley on a very beautiful cycle path steadily uphill past Serfaus, Fiss and Ladis. We turned off on the Reschenstraße to the south and continued to climb over the Finstermünzpass to 1,150 m, where we found a very nice campground between two tunnels. We cooked and lay in the evening sun. The next day we went past Nauders the last meters up on the Reschenpass to 1.508 m altitude, which we then crossed the border to Italy. (63 km, 1,981 metres in altitude) About very beautiful route it was mostly on bike paths along the Reschensee with its famous sunken church tower in Graun in Vinschgau over and continue along the Haider lake downhill. After slipping we turned southwest to Prad am Stilfserjoch. We started a few more kilometers of ascent, but Anne had caught something and so we asked a farmer if we could pitch our tent at 970m on his lawn. The next morning Anne drove back to the place, but neither doctor nor pharmacy had opened. So she came back and we waited another rain shower, before we packed up and started slowly uphill. After only 10 km we stopped again in Trafoi at 1,250 m. Since it was a bit bad for me and Anne was not any better, we pitched our tent on the campsite. And that was fine, because it got worse with both. After a night of hell we drove the next day both by bus to Prad to the doctor, covered us with medication and waited at 35 degrees on the bus back to the tent, where we spent the rest of the day. In the morning we were feeling a little better, but due to thunderstorms we stayed in the tent and only later went for a short hike to the Three Fountains. The next day, snow fell on the tent in the morning! The snowfall limit had dropped to 1,800 m, elsewhere even to 1,000 m! The pass road was therefore covered with snow! Since it rained until the afternoon, we did not go yet, but finally went back to eat something. The next day the sun was shining again and so we started cycling. I was fine, not so much with Anne. Slowly we climbed to 2,000m, but Anne was feeling worse. After a break, it was still up to the Stilfserjoch at 2,758 m altitude with a magnificent view through spectacular scenery! Then it went a bit warmer on the exit and a short time later we rolled over the border back to Switzerland. (570 km, 8,907 metres in altitude) We continued to roll downhill, turned into Sta. Maria turned west and due to the lack of an affordable room we turned a short time later into a dirt road on a sunny covered meadow, where we opened the tent. The next day was a little better and so we start slowly uphill on the Ofenpass at 2,149 m, roll downhill and back uphill and then down to 1,400 m to Zernez. On a mountain bike route we drove to the Upper Engadine to the southwest very steep and exhausting, but through beautiful scenery and of course without traffic. With a tent night we then turned west before St. Moritz and drove over the Albula Pass up to 2,312 m. Slowly Anne got better and so we rolled downhill again and through the beautiful village of Bergün and on to Tiefencastel. Through a narrow ravine with tunnels we pedal downhill to 670 m behind Cazis, where we pitched the tent again. The next day we continued downhill to the Rhine Gorge, where we then turned west and Flims, Laax and Falera on the other side of the valley followed the Vorderrhein upstream. About Breil and Disentis we drove until shortly after Sedrun, where we camped at 1,475 m. Over the Oberalppass it then went to 2,044 m and a great descent down to Andermatt at 1,460 m, before it went again long and exhausting up to the Furka Pass at 2,431 m. From there the descent went spectacularly past the Rhone glacier to Gletsch at 1,760 m, where we drop off again after coffee and cake and drive back up to the Grimselpass at 2,165 m. Unfortunately then in continuous rain and thus in full rain gear. Over a long 1,500-meter descent, we went partly through rain and hail down to Innertkirchen at 640 m altitude, where we were looking forward to the hot shower at the campsite. The next morning, the sun finally appeared again from the blue sky. We turned west into the Rosenlauital on a small road. Pretty steep and winding, it went steadily uphill over a then completely closed to traffic, very beautiful road through great scenery. Past the Wellhorn and the imposing wall of the Wetterhorn, we drove up to the Große Scheidegg at an altitude of 1,962 m. The Eiger north face was unfortunately mostly in clouds, but the panorama was spectacular! Over the crowded Grindelwald with tourists we drove down to Interlaken on 600 m and beat in the rain our tent on the west bank of the Brienzer lake. After breakfast in the sun overlooking the lake, there was unfortunately a lot of traffic over the Brünigpass at 1,006 m, down again and over a bike path east of the main road through hilly landscape to Stans and Lake Lucerne. With the ferry we sat for 8.00 CHF per person over the lake to Gersau and cycled very nicely along the lake shore to Schwyz. After a tent night we went over a 932 m high saddle between Lake Zurich and Obersee on 400 m altitude to the north, where we turned onto the cycle route 53 and on a very beautiful route up to 750 m and cycled over Fischenthal and Bauma to Winterthur. After some back and forth we had found the road to Schaffhausen and met the bike route 86. We camped at the Thur on the riverbank, before we drove on the next day to the impressive Rhine Falls of Schaffhausen. On cycle route 2 we cycled along the Rhine along a very beautiful route eastwards to Stein am Rhein. (53 km, 320 metres in altitude) Along the Rhine and later along the Zeller Lake, we continued on a great route to Radolfzell with its very beautiful old town. Along the shore of Lake Gnadensee we went eastward. Because of the expensive entrance we left the island of Mainau and cycled on to Constance. There we crossed the border into Switzerland again. (48 km, 188 metres in altitude) On the route 2 we drove along the southern shore of Lake Constance to the east and once again pitched the tent on the edge of a corn field behind Güttingen. Here at Lake Constance we were again at 450 m altitude. We cooked again in the best weather before going back the last 36 miles to my sister the next day.